It is a wedding card, not your crafts project! Hindu weddings are certainly a very colorful event but incorporating too many colors into the wedding card will just make it a funny parchment! Use a set defined color combination and follow it thoroughly, don’t try to fit in every element into your card. A few days ago I had a laughter blast when in one of the weddings I saw “Child-wine and Child-Beer” in the menu card of a wedding! Dude how could you write chilled as child?????? Be very particular about your wedding stationery; don’t let others know how casual you are! Ask for help from a friend or relative who has a good command over English and let her/him be the in charge of the proofreading part. 3) No time to proof read? Each and every time I proof read, I notice something that I haven’t noticed and corrected before. And the same applies to you as well. Proof read the wedding wordings and format properly so as to avoid big blunders on the wedding stationery. Cross check everything including the address, date, timing, names, EVERYTHING! 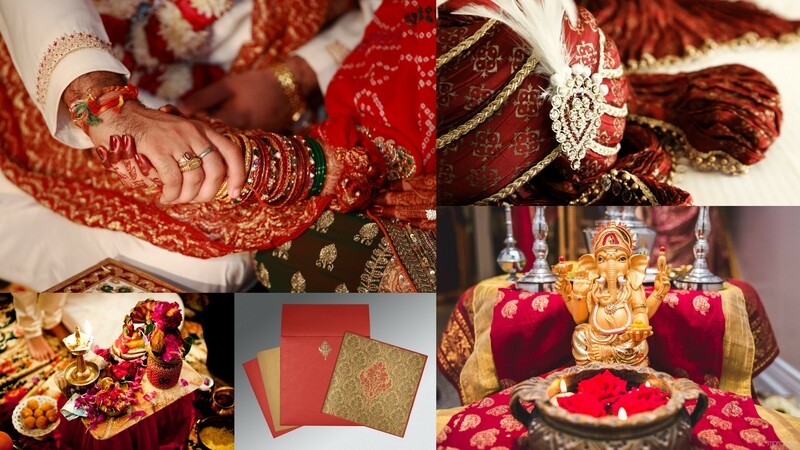 While you order your Hindu Wedding Invitations make it a point that you order a few extra copies as well. Because I know in Hindu weddings, the guest’s list is so big that it is quite an expected thing that you will definitely miss out somebody. So be prepared in advance and keep a room reserved for improvements. 5) Chocolates in summer that too packed in paper box! Most of the elite couples believe in sending sweets along with the wedding cards. The idea is well liked and is good no doubts but please pay attention to the pros and cons! Sending Bengali sweets or chocolates to far off cities pairing with the wadding cards is such a lame idea! It is a straightforward murder of money and prestige. It’s just a wedding card not your wedding biography! Avoid making it too lengthy by stretching the information incorporated into it. Adding plethora of details will confuse your guests and the main highlights will get hidden! Keep it short and précised. We know you are happy and excited but please control and don’t make your wedding card a display board to express your feelings. Though the Thank You cards are not a fad in the Hindu weddings, yet if you are planning to send them then please do it nattily. Communicate your idea and requirements for Thank You cards when you talk to the wedding stationery dealer about the wedding invitation. Order the cards beforehand so that you can get a good time to write down your feelings in them. Courier the wedding cards please! At least you have the tracking option available and you are assured that the card will reach on time. Being dependent on postage just to save a few bucks will bring you in a big jeopardy.